Contemporary composers each have styles theater wags can identify immediately and can have fun parodying. I actually do a rather decent musical passage from “Waiting for Godot” as if written by Stephen Sondheim. Borrowing the time-honored melodramatic story of the landlord who comes to collect “the rent, the rent” from a forlorn ingénue who doesn’t have “the rent, the rent” Rockwell and Bogart set it to music in the recognizable rhythms of the gentlemen listed above. For Rodgers and Hammerstein, they compose a rendition called “Corn” that includes all of Hammerstein’s allusions to nature and cover titles or key lines from the complete canon of R&H shows. To spoof Lloyd Webber, they reprise the same melody ad infinitum, and cast the phantom of the opera as the landlord while Junita — get it? — is the damsel being harassed. Brassy belt tunes blaring peppy lyrics littered by women’s names are used to skewer Herman. Dragged chairs, exposed skin, German accents, and Fosse dance moves await you at Kander and Ebb’s “Speakeasy.” Minimal melodies and inexhaustible rhyme denote the work of Sondheim. 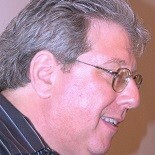 Even the unbilled Marvin Hamlisch gets his turn going through Rockwell and Bogart’s spoof mill. The five one-act musicals are all fun because Rockwell and Bogart know their sources and hone in on the precise traits that give each composer or team their indelibly individual identity and equally eloquent eccentricity. “The Musical of Musicals” is a simultaneous homage and a takeoff , and Souderton’s Montgomery Theatre makes the most of the jokes and the affection Rockwell and Bogart built into lyrics and tunes that have just the right measure of familiarity and contempt. Stephen Casey directs an energetic and vocally gifted cast that has thorough knowledge of the models it’s lampooning and adds visual gags, physical comedy, and facial expressions ranging from forced musical comedy smiles to ironic eyes in a fine frenzy rolling…and rolling…and…. 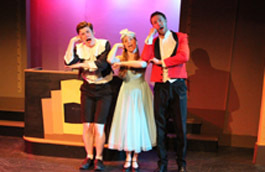 Casey’s actors are called on to sing a wide variety of musical styles while indulging in broad or subtle comedy depending on the composer being roasted. The Montgomery cast complements each other well. Larger than life Michael Doherty with his innocent Campbell Kid visage and his goo-goo-googly eyes brings size and physical commentary to the production while Joseph Michael O’Brien lends a sleek litheness to his portrayals of the grasping landlords. Chelsea Grace Claiser can be sweet or conniving as the down-and-out usually short of rent while Erica Scanlon Harr is the reasonable friend or advisor who offers succor and suggestions but no cash. Each member of the company sings beautifully while being able to bend his or her voice to character bits. The ensemble also moves well, and Casey provides them with choreography, some of which parodies the dances of Bob Fosse or Agnes DeMille, that enlivens “The Musical of Musicals” and adds to its abundant humor. The best of Rockwell and Bogart’s parodies is “Corn,” for which the composers mine every kernel of Rodgers and Hammerstein’s telltale idiosyncrasies and pop them into a funny, frothy sketch that uses the characters of “Oklahoma!” as models and refers to dozens of memorable lines and song titles while incorporating a hilarious ballet sequence and making fun of the various accents R&H characters are asked to use in the composing teams’ hit shows, etc., etc. etc. Fluttering hands serves as send up to the dances of Agnes DeMille. O’Brien’s Jud takeoff, called Jidder in an equal nod to “Carousel” calls every one around him Miss or Mr. High-and-Mighty while Harr, playing Aunt Eller has to go from miming the churning of butter to acting out cleaning clothes on a washboard when stage directions, read with aplomb by stage manager Paul Dake, give conflicting, contradictory information. Just about every R&H show is touched on as the Montgomery cast make hay out when a slapped face doesn’t hurt or how much some enjoy being a girl until they say so long, farewell, auf Wiedersehen, adieu and move on to another composer’s oeuvre. The Sondheim segment, “A Little Complex,” features a Sweeney Todd-like landlord and ingénue who knows how to play her cards to get the response she wants. “Aspects of Junita,” the spoof of Lloyd Webber, has an renter who won’t pay because she shriekingly detests the middle classes personified by the Phantom who may accept some personal favors in lieu of rent. Rockwell and Bogart are especially canny in spoofing the reprising nature of Lloyd Webber scores, as well as rolling and swelling of the composer’s rhythms. For “Speakeasy,” the send-up of Kander and Ebb, Rockwell and Bogart draw on the international rhythms the composers use, in particular the tingel-tangel sounds of “Cabaret” and the staccato numbers that dot “Chicago.” “Dear Abby” satirizes the all-purpose competence of Jerry Herman’s popular women, Mame and Dolly, while capturing the brightness and amiability of the tunesmith’s work. “Fun” is the operative word as the Montgomery cast keeps all brisk and entertaining. “The Musical of Musicals” is more enjoyable if you know the material being spoofed, but the show works even if you don’t know Evita from Aunt Nettie or Sally Bowles from Dolly Levi. From his years at Bucks County Playhouse, we know Stephen Casey shows keep a sharp, musical pace, and “The Musical of Musicals” is no different. The individual skits, and the production in general, fleet by, action being non-stop and comic bits being quick and plentiful. 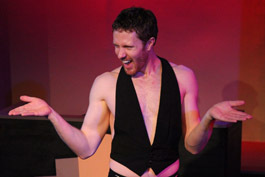 Michael Doherty, cast in each skit as the young man who comes through with the distressed damsel’s rent, is a male hoyden who seems to be up to mischief even as he foils villains and assures the ingénue’s reputation. Doherty is irrepressible in his effort to entertain. His performance is big but never annoyingly so. Doherty has the showman’s instinct for knowing how far he can go and stopping right at that limit. He provides a lot of the production’s energy and is always intensely involved in each sketch. Even when she’s playing a character who is sophisticated or deceptive, Chelsea Grace Claiser seems defensively vulnerable at each skit’s maiden in peril. Claiser has a wonderful voice that can croon an R&H melody, bat out a Sondheim mile-a-minute lyric, turn operatic for Lloyd Webber, and go raspy in Kander and Ebb’s Berlin. Joseph Michael O’Brien is the subtle member of the cast who can quietly steal scenes although his co-stars usually have the flashier parts. O’Brien is especially effective in the “Speakeasy” sequence when both his toned muscles and his gift for nonchalant comedy show. Erica Scanlon Harr dominates the stage with commanding presence as the usually comforting but sometimes disrupting woman who job can be to ameliorate or upset a situation. The voices, individually and as a group, are marvelous in this show, and Casey’s cast display a great range in versatility as they play multiple characters per script while keeping the tone of each skit. The performers are accompanied on a single upright piano played by a woman who seems to be as amused by the music as she is adept at playing it. “The Musical of Musicals” provides a good time for theater cognoscenti and the dabbler who can tell an enchanted evening when they see one. “The Musical of Musicals” runs through Sunday, May 4 at Montgomery Theatre, 124 Main Street, in Souderton, Pa. (which has, except for the theater, to be one of the sleepiest town in the U.S). Showtimes are7:30 p.m. Wednesday and Thursday, 8 p.m. Friday and Saturday, and 3 p.m. Sunday. Tickets range from $37 to $29 and can be obtained by calling 215-723-9984, extension 10 or by going online to www.montgomerytheatre.org. This entry was posted on April 23, 2014 by nzoren in Theater Reviews and tagged Andrew Lloyd Webber, Chelsea Grace Claiser, Eric Rockwell, Erica Scanlon Harr, Jerry Herman, Joanne Bogart, John Kander and Fred Ebb, Joseph Michael O'Brien, Michael Doherty, Montgomery Theatre, musical, Parody, Paull Dake, Rodgers and Hammerstein, Souderton, Stephen Casey, Stephen Sondheim, The Musical of Musicals.